The (original) Brooklyn Eagle newspaper published from 1841 to 1955. I had a bicycle delivery route in 1952, in Flatbush, Brooklyn. They told us it was our own business; we bought the papers from the territory dispatch office, learned how to fold them so we could toss them as we rode up-and-down the blocks of our route. 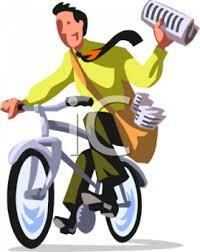 The paper sacks were designed to hold over the shoulder (as shown in the illustration) but they also fit across the handle bars of the bike. We packed our folded papers into the sack, strung it across the handlebars and went out on our route every day. This entry was posted in Brooklyn History on April 1, 2015 by brookadmin. Many Italian immigrants from the early 20th century brought their wine making skills with them and continued to make wine in their homes, even during prohibition (1919 – 1933). My grandfather Nicola was one of them. He continued to make his wine throughout his life. I remember, when I was a small boy in the 40’s, the annual ritual. The grapes were shipped from California at harvest time. They were packed in wooden crates with colorful lithographed labels on the ends. Grandpa would take me by the hand and we would walk along the avenue, looking at the cases of grapes that the merchants had stacked outside their stores, on the sidewalk. Grandpa would pluck a couple of grapes from a crate and taste them, nod or shake and we would move on. When he finally found what he wanted he would haggle with the merchant about the price. When the deal was done the merchant would send his men down the avenue to Grandpa’s house, carting the crates on their hand-trucks. Once at the house we would get the grapes downstairs to the cellar where the press was. When all was said and done there would be a gallon jug of red wine on the floor, at Grandpa’s feet, at the Christmas dinner table. All of us, even the kids, got to taste Grandpa’s wine then. Enjoy more memories of the early 1900s Italian Americans in my book, The Brooklyn Iceman, available on amazon.com. This entry was posted in Brooklyn History on March 3, 2015 by brookadmin. 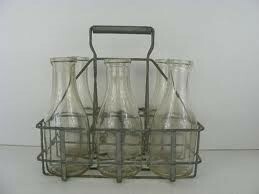 The milkman carried his orders in a wire rack that held 6 or 8 bottles of milk (see photo at right). Each customer had a standing order, such as two bottles of milk three times a week. 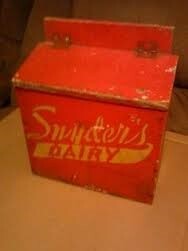 Each house had a milkbox (see photo below left) that the milkman put there for his orders. When he arrived he expected that the customer would have cleaned the old, empty bottles and placed them in the milkbox. He would remove the empties and fill the milkbox with the new bottles. If the customer had a change in their order there would be a note, rolled up and placed in the neck of the bottles, and the milkman would have to change the order accordingly. Some homes were built with a cabinet installed into the exterior wall under the kitchen window. The cabinet had two doors, one that opened from the outside and one from the inside. The milkman would open the cabinet from the outside, take the empty (and washed) glass bottles, see if there was a note about changes in the order, and then place todays order (milk, butter and eggs) into the cabinet. During most of the year the temperature was cool enough so that the cabinet actually acted like a refrigerator. Later that day the customer would open the inside door of the cabinet and have her day’s order, fresh and cool. This entry was posted in Brooklyn History on September 15, 2014 by brookadmin. Looking back on Brooklyn history in the 1940’s, when I was growing up, every neighborhood had a caravan of wagons driven the through the streets, peddling fresh fruits and vegetables, laundry bleach, ice, and, of course, the early morning milk man. The iceman was vitally important to everybody; homes, businesses, even the other peddlers. The Iceman is the focus of my book, The Brooklyn Iceman. First they were horse-drawn wagons and then trucks, but still, some of the peddlers kept on with their horse-drawn wagons. That was because the horse was their partner. The horse knew the routes, the streets, the stops. The horse could navigate the streets themselves while the peddlers stood up in the wagon and called out whatever they were selling, “Fruits and vegetables,” “Javell” (more about that later), and other goods and services. Except, of course for the milkman. The milkman came very early in the morning. Brooklyn history records many local dairies operating in Brooklyn, including Eastern Farms, a dairy owned by the Sacks Family, good friends of mine. 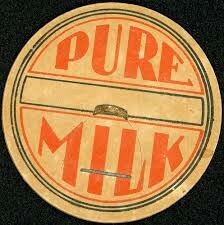 Milk was in glass bottles, often molded with the dairy’s name on them, and with a small paper board disc as a lid that fit into the inset in the neck of the bottle (see photo top right). If you look carefully at the lid (at left) you’ll see the little tab that was used to lift the lid off the bottle. At that time milk was not homogenized. The cream separated and came to the top of the milk, in the neck of the bottle. This delicious rich cream, perfect for coffee or whipping, just poured out of the bottle first. Otherwise, for milk, you had to carefully shake the bottle, very careflly, holding the lid tightly, so you mixed the cream with the milk together. These was the times that Vincenzo Castella, The Brooklyn Iceman, lived and worked through in Brooklyn history. This entry was posted in Brooklyn History on August 8, 2014 by brookadmin.